Why has Zerodha increased intraday trading margins for BO/CO/MIS citing added volatility? Wealthmantra - a wannabe discount broker expelled by BSE and NSE. Anyone knows the reason why? Can someone explain why? I know markets have been very volatile post budget, but how does it make any difference to Zerodha? If you were to buy stocks with 100% money in your account, or if you were to sell stocks which are sitting in your demat account, there is no risk we or any brokerage firm would take. This is one of the reasons why we don’t charge any commissions on equity delivery trades. For all other trades - intraday equity with leverage using MIS/BO/CO, or MIS/NRML on F&O, there is a significant risk a brokerage firm takes. The margin asked from a client is to mitigate this risk to whatever extent possible. Let me explain with an example of the stock price of PC Jewellers stock price on 2nd Feb (I know it is exaggerated on that day, but still so that you can all keep the risk brokerage takes in your mind). The stock opened at 460, went down all the way to around 220 and bounced back to around 400. All within minutes. Assume the intraday MIS margin at the start of the day was 5X and about 8X for CO/BO. This means, with Rs 1lk, you could have bought stocks worth up to Rs 5lks. So around 1080 shares (Rs 460 was the stock price). The stock suddenly fell 200 points, which would mean a loss of Rs 2.2lks if the client exited. But the client has placed only Rs 1lk with us. What about the rest Rs 1.2lks? This has to be given to the exchange by end of the day. If the client doesn’t transfer, it is the responsibility of the brokerage to pay the exchange. These potential losses get crazier when it comes to CO/BO, as the leverage is much higher than that of MIS orders. Leverage is higher for CO/BO because there is a pending SL in the system. But when stocks fall off a cliff, the stop loss will trigger only at the market price available. It is the same with futures and options. Inherently all F&O contracts are already leveraged. MIS/BO/CO order types add more to it. All brokerages offer leverage to the trading community knowing the risks being taken. Risks shouldn’t be compromising for business. A lesson many brokerages have learnt in the past going bankrupt after leveraging and allowing their clients to do the same excessively. This is the same reason we might block trading in bracket or cover orders on extreme volatile days as the leverages they offer intrinsically is a lot more. Yes, there is a standing stoploss in these orders, but like I explained earlier, these are of no use if markets suddenly move up or down. As a business, we are quite conservative in terms of risk. Whenever we believe there is increased volatility, the margin requirement goes up automatically. This is to ensure that there are enough funds to cover any losses that any client can create (not possible to do completely, but whatever we can). If we don’t do this, we will be taking a systemic risk with all our other clients. When orders are rejected, it shows up the reason. Not possible to block product type as we might allow during the course of the day. Why not allow BO/CO trading but with lesser leverage. Similar to what is offered for MIS? So is there a chance of allowing BO and CO if the market becomes somewhat stable today? The margin required for BO/CO is based on how many points away your stoploss is. This is not really dependent on SPAN margins like MIS. SPAN dynamically goes up with volatility, but stoploss that you select can remain the same for BO/CO. With BO/CO, when stocks/index options are hitting circuits, the entry order will get executed. But the Stoploss/target will get rejected because of circuits. What this means is there will be a hanging BO position without a corresponding SL/Target. The only way this can be then exited is by our RMS team. With this much volatility, there is also a high probability of both stoploss and target getting executed at the same time on bracket orders. Which again would mean a hanging position in case of bracket orders. Yes. But the way markets have closed in the US, I doubt if volatility will subside. If anything it might go up once Europe opens. I agree. I understand the risk the broker would be taking, but they can at least limit the position taken in CO/BO (say 1 lot in F&O per user) instead of banning it altogether. 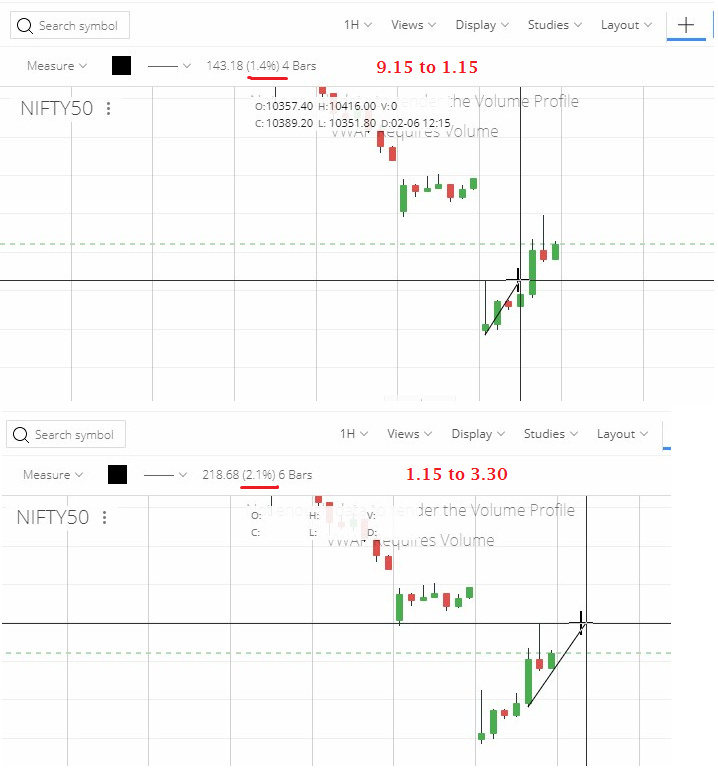 Guys, Trust me Blocking BO/CO in volatility condition Like this is Best Option For Any Broker as well as for their Clients. Just because of Volatility You can lose all your Capital and Your Account can go in Deep Loss You Cant even Imagine. For this Loss it will be only You responsible and Not Even SEBI will Help you out. So, Its better to Manage your Risk than Being greedy. I know People are Blindly firing Orders and Just Simply betting with out any Risk management. 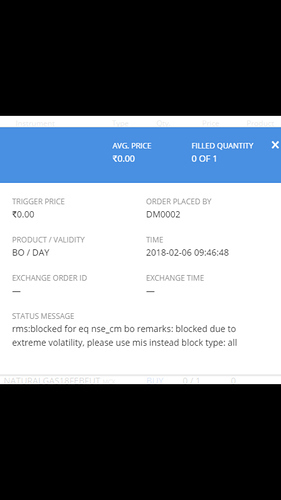 You will Only realize this when you will face this Technical glitch in real with your order when it will go open and you will say Why Broker have not Blocked Risky order Type. I have faced this Problem I know what it feels Like. Frankly, i don’t see that much of volatility today. Market opened at a low but then have been range bound. For retail traders like us who does intraday and shorting this is a wasted opportunity. If this goes on, then Zerodha will not wok for us. 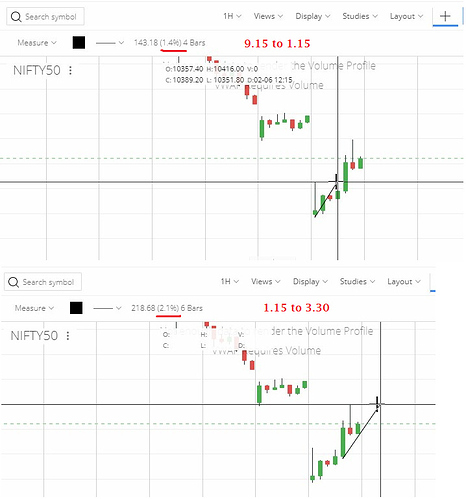 as nifty shows more volatility after 1 pm when zerodha enables BO/CO, but as day traders we missed some breakouts at beginning. 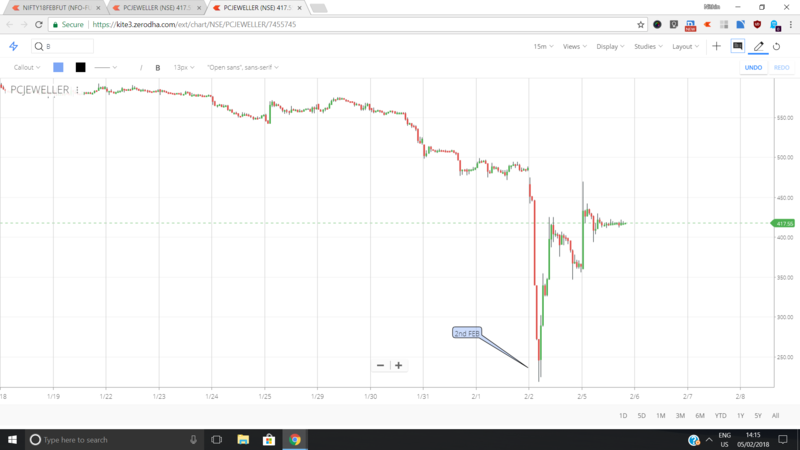 I am not saying everyday will be same but it seems like in future volatility is in higher side and we cant miss it everyday. MIS is also leveraged so why is it not blocked like BO/CO? MIS can also hit zerodha and its clients in negative way during volatile days.